Sable Vol.1 brings Spitfire Audio's ambitious orchestral library concept sharply into focus. Multi-mic positions provide incredible flexibility and creativity. Focused sound allows for scoring with intimate detail if required. Bespoke Overlay patches perfectly complement Albion's articulations. Hot on the heels of its much-admired Albion orchestral collections comes Spitfire Audio's Sable String Vol. 1 - a set of string sounds designed to aid the writing and production of more focussed violin and cello parts. The Sable Strings mission is to provide a detailed, almost concentrated string sound. Accordingly, Vol.1 offers First Violin and Cello sections of just four and three players respectively, recorded 'in stage position'. Vol.2 will provide Violin 2 and Viola sections with different players to ensure that, when used in combination, these patches provide staggering levels of authenticity. Vol.3, expected in June, will expand the range of articulations further. While Sable has proved perfect for small ensemble scoring, it has broader uses as we'll soon see. As you would hope, a large number of articulations is offered for both the Violin and Cello instruments. 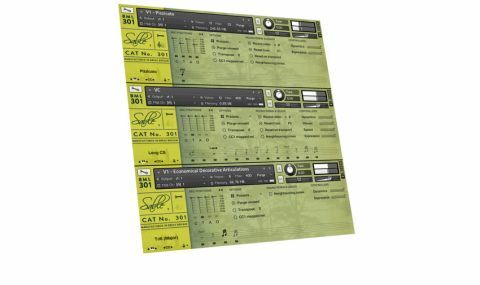 However, as well as providing a brand new pair of string sections sizes, Spitfire has widened recording engineer Jake Jackson's remit by asking him to capture a larger range of microphone positions. You're still offered the Close, Decca Tree, Ambient and Outrigger positions familiar to other Spitfire Libraries, but now you'll also find a collection of Alternative Mics. These feature Stage, Gallery and Close Ribbon options, plus a varied collection of Stereo microphone positions labelled Broad, Medium and Fine. Of course, you can load the programs for these simultaneously to create bespoke section 'sizes and ambiences' of your choice, expanding the palette of colours as you do. There are even surround-ready programs. "You can add Sable's presence and 'front end' to the rounder, bigger sounds of the full Albion libraries"
Quite aside from using these patches on their own, Spitfire Audio has taken steps to ensure that the Sable programs are fully compatible with the Albion Libraries. The Albion Overlay programs within Sable provide a matched set of articulations for each of these, so you can add Sable's presence and 'front end' to the rounder, bigger sounds of the full Albion libraries. Used in combination, this enables you to create a richer sounding, more focused string section with extensive MIDI CC options available to fade in a powerful orchestral sound underneath Sable, or vice versa, to bring extra focus and detail after a richer orchestral start. If you've read my other reviews of Spitfire Audio's libraries you will know we're huge fans of this company and their great sounding scoring tools that are both intuitive and flexible to use. Sable Strings Vol.1 offers a glimpse into Spitfire's promising future. We cannot wait to hear the forthcoming volumes and to see similar levels of sonic detail emerge for other orchestral sections over the coming months.